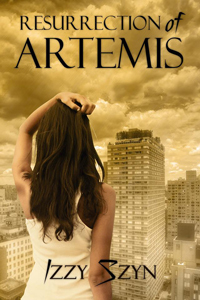 When incidents similar to the ones Amy did start occurring, all fingers start pointing in Artemis' direction, including three people that want Artemis to come out of retirement. Quail City's superheroes Dark Master and Calypso aka as multi-billionaire Noah Adams and his assistant Vanessa London know Amy's secret, and also know that she is being set up. Having spent months in a flirtmance with Amy, they are tired of waiting and want both her and Artemis in their bed. Hinderer wants to hold technology hostage, but in order to do so he needs Artemis' assistance, and he will use any methods necessary to gain her cooperation. New York Times Bestselling Author Izzy Szyn was born in May of 2014 when a friend dared her to write. Born and raised in Detroit, Mi. Izzy now lives in Oklahoma City with her furchild Misty, the friendliest Chihuahua/Terrier you will ever meet. Izzy currently works in a call center, where she writes in between phone calls. She loves to keep in touch with her readers. Welcome back! I shared this to Pinterest, G+, Twitter and Facebook.